Remember ads from the 80s for shower AM/FM radios? Well I went looking for one for this post and it turns out that Shower Radios are still as much a thing now as they were back when I was a kid. Which, given the movement for greening our homes, raises an important question: just how long are people spending in the shower in order to require entertainment? I mean, are you really getting bored in there between all the shampooing and scrubbing and other hygiene-related activities? Has the rapid-fire nature of gaming and social media reduced our attention spans so much that we require diversion from something as simple as showering? Now, let's be honest. My house is wired. I have speakers in my bedroom ceiling that are wired to the house entertainment system and using my phone, I can tap into Rhapsody, Songza, the general web and my home media library to have audio running in my room as I get ready in the morning. So, I'm not against it by any means, but I do find a shower radio a bit odd. I mean, once I'm dry, I'm not really into the idea of stepping back into the shower to turn off the music. But I guess for marketing purposes, a shower radio might sound a little more consumer-friendly than a (more accurate) bathroom radio? toilet radio? potty radio? Yeah, ok, I'm starting to see the issues with naming this product. 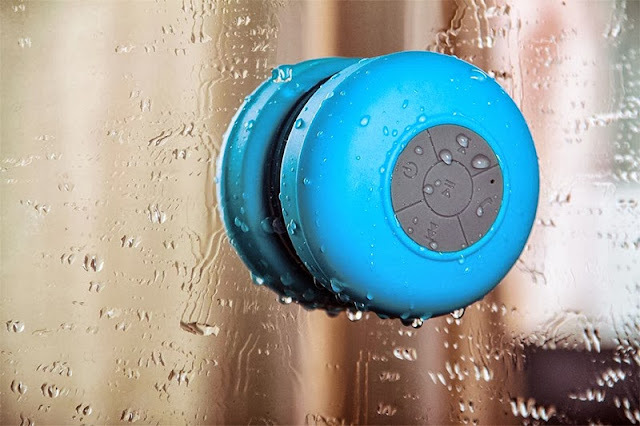 If you're looking to listen to audio streaming from your smartphone, computer or other device as you primp, you might be interested in the Abco bluetooth speaker which can adhere to smooth surfaces via suction cup so you can put it on tile, a mirror or even your shower wall. And it has a phone feature, because, you know, no one will ever be able to tell from the echo and, you know, the sound of running water that you're chatting with them from the shower. This is a feature people want? I can honestly tell you that if someone takes my call while in the shower, I'll be offering to call them back. Of course, they might forget about me while rocking out to their tunes and using up all the hot water. I am clearly not the target market for this one. Are you?